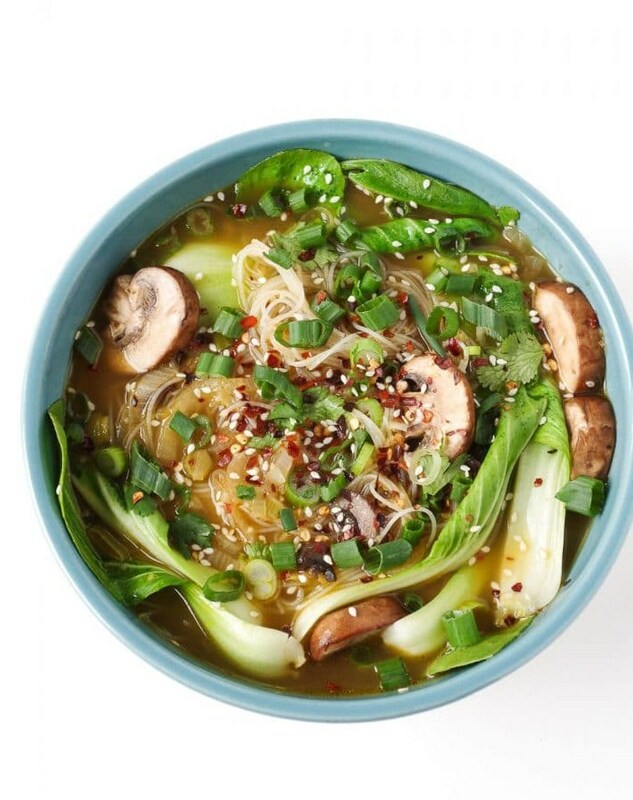 Ginger Garlic Noodle Soup with Bok Choy is a nutritious, comforting, and flu-fighting twenty-minute recipe made with homemade vegetarian broth, noodles, mushrooms, and baby bok choy. Easily make it your own by adding chicken, shrimp, spicy chilis, or other veggies. Heat 1-2 tablespoons olive oil in a medium-sized stockpot over medium heat. To the oil add the diced shallots and mix well. Cook over medium heat for 4-5 minutes, or until the shallots turn translucent and start to soften. Stir often. Chop the end off of each green onion- dividing the white part from the green part. Chop and set aside the green part for topping. Meanwhile, finely chop the white part of each green onion. Add the white part of the green onions, minced garlic, and ginger to the shallots and mix. Cook, stirring occasionally, for 1-2 minutes or until garlic and ginger is fragrant. Carefully pour the chicken stock or water (or mix) into the pot and bring to a simmer. To the pot add the star anise and soy sauce. Cover and continue to simmer for 10 minutes. Remove lid from the pot and carefully remove and discard each star anise from the soup. Add the sliced mushrooms, uncooked noodles, and bok choy to the pot and simmer for 5-8 minutes, or until noodles and bok choy are tender. Season to taste. Divide soup between bowls and garnish with sesame seeds, the green parts of green onions and red pepper flakes (if desired). Not everyone loves the taste of star anise. However, I find that it plays a crucial role in the flavor of the broth. That said, if you hate it or don't have any on hand, I have found cinnamon sticks to be a good substitute. Need a little protein? Don't be shy about adding some chopped chicken or shrimp to the soup approximately 5 minutes before serving (assuming the chicken has been previously cooked). For a lower sodium diet, you can substitute low sodium soy sauce, and/or substitute unsalted chicken broth.